The relations between the academic community and the Hindu community in North America have recently come to be characterized by a sharp debate, which has also spilled over into journalism and on to the Internet. It was prompted by the reservations expressed by a significant number of Hindus in North America over the way Hinduism is portrayed in the Western academia and by the vigorous response of the academic community to such criticism. As an academic, who is also a Hindu; or conversely, as a Hindu, who is also an academic, I (along with some of my other colleagues) stand at the volatile point of intersection between these two communities. This makes my role in the debate particularly fraught but also, by the same token, also particularly sought at times. I was requested a couple of years ago by Mark Silk, Professor of Religion in Public Life at Trinity College, to address the issue through an article in Religion in the News.1 I am thankful to him for having provided me with the opportunity. That was in 2004. Now, after an interval of three years, I have been invited to write this preface to a book which documents an important segment of this ongoing controversy. It seems only fair that I should accept this request as well. It enables me to examine the issue once more and to tease out my thoughts on the issues further in this already tense narrative. 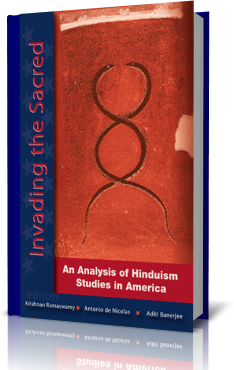 This book singes with the sparks that flew as the psychoanalytic approach to the study of religion became the lightning rod of the grievances of the Hindus, particularly those residing in the United States, against a cross-section of the academic community in North America devoted to the study of Hinduism. It documents the way these grievances were articulated and ventilated, as well as the response from the world of the Western academia and, to a certain extent, from the media, as the issue came to a head. It seems to me that the issue first needs to be viewed on the broadest canvas possible, namely, that of history, before one turns to the details. Thus another dimension was added to the channeling of religious communication- from outsider to insider. This age of European imperialism had run its course by the end of the Second World War, and, with the liberation of the former colonies, the direction of the discourse took yet another turn. The members of the various non-Western religious traditions began to challenge their colonial descriptions in the post-colonial world. Now the insiders themselves began to claim the right to tell the outsiders about their faith, thus reversing the flow of information from outsider to insider, to insider to outsider. It could be argued that this book reflects the state of discourse about Hinduism at this cusp of insider to outsider. If the perspective presented above possesses some measure of verisimilitude, then we are now at a turning-point in the relationship among the interlocutors in the study of religion. Historical changes, however, are not linear, even when their direction is discernible. Historical changes are more like the changes in ocean flows caused by tides. It is sometimes not apparent that the tide has begun to turn, even when it has. And even as the tide advances there are backflows, which tend to confuse the onlooker. Such a tidal shift generates eddies and undercurrents. The going is not as smooth as at high tide, when the scene takes on a serene aspect and the ocean seems to bare its bosom to the moon, as Wordsworth might say. This metaphor, if not off the mark, may serve to both illustrate and explain the messiness of the present situation. However, although it might make it more understandable, it does not make it easier to deal with, for many issues seem to demand our attention all at the same time. What one is thus experiencing now in the academic world is the crossing of the response threshold by the Hindu community in North America. This Hindu community in North America has now reached the demographic critical mass, when its reactions can no longer be disregarded. As teachers of religion we have perhaps already had our own more innocuous experience of the response threshold being crossed by our students, when we have fielded questions by students who belong to the very faith we are teaching. This raises the question: How are we to react when members ofthe faith community, and not just members of the student community or colleagues in the academic community, cross the response threshold? The answer to this question is now in the process of being formulated before our very eyes and the reaction to this book will provide one answer to the question. It is clear from the documentation provided in the book that the protest is not always about facts which may be adjudicated on the basis of evidence but often about interpretations, especially psychoanalytic ones, which do not seem susceptible to such verification. The main achievements of modern science proceeded from the falsifiability of its hypotheses but such does not seem to be the case here. We thus need to distinguish clearly between cognitive and non-cognitive approaches to the study of religion. This distinction is crucial. (1) Are such sentences intended by their users to be construed cognitively? Once the presentation of the tradition, which happens to be non-cognitive in nature, is attacked by the followers of the tradition, the non-cognitive approach may be far more open to frisson than if a cognitive approach were being employed. If, for instance, some scholar was attacked for claiming that the worship of Ganesha is a relatively late arrival in the Hindu pantheon,8 then the charge could be met by pointing to existing historical evidence, which is not possible if a scholar is accused of misinterpreting Hindu mythology in the light, not of the tradition, but in terms of the scholar’s own educated imagination. Here we have another version of the personalist epistemology insinuated by the phenomenological method in the study of religion, except that the person involved in this case turns out to be the scholar studying the tradition rather than a member of the tradition! One could perhaps appeal to the verdict of the “academic community” on the point, just as one might determine the stance of a “faith community.” The fact, however, that the approach is non-cognitive, which is to say non-falsifiable either historically or phenomenologically, does seem to suggest that a new set of criteria might be required to assess it. It makes the study of religion less of a science to that extent, and more of an art. This fact also complicates the claims to academic freedom, for how is one to adjudicate the charge of the community that, in a particular instance, an exercise in academic freedom has turned into an exercise in academic licence and that the exercise in academic licence, in its own turn, has turned into an exercise in academic licentiousness? How to adjudicate differences of opinion, sometimes sharp, between the academic and faith communities, with criteria acceptable to both? The insiders, after all, cannot be excluded indefinitely. In this book, the critics of the academics claim in essence that the academics are either biased or in gross error when dealing with some aspects of Hinduism. However, fallibility is a human condition—no one is either infallible or capable of achieving Archimedean objectivity. Both common sense and humanity demand that some procedures be devised in our field for distinguishing between random human error and error caused by bias (conscious or unconscious). Only a person guilty of the latter should reasonably be put in the dock, as it were. The task might appear insurmountable on the face of it, but there is good news. Statistics as science is concerned with, and indeed has, evolved ways of distinguishing between random error and systemic error (or bias) through the process known as hypothesis testing.9 It is a pity that for all the rage statistics is enjoying, no one has been willing to give to the discussion of Orientalism this scientific turn. What one needs is a data bank of examples of (alleged) biases and errors pertaining to a work, and individual scholar, or a field of scholarship. This will make it at least theoretically possible to identify both orientalist as well as chauvinistic excesses in current discourse perpetrated by “outsiders” and “insiders” respectively. The current situation thus enables us to identify a third new challenge: the need for creating a data base for which the following acronym is proposed: ASBESTOS (Archives for the Study of Bias and Error in the Study and Teaching of Religions). Pandora’s box will perhaps not be opened, as it might otherwise, if it is kept statistically sealed. Members of both the Hindu and the academic community have expressed deep distress at the ad hominem nature of the attacks leveled on or by the members of the two communities. This book, to which this preface is being written, itself attests unabashedly to such a state of affairs. The Hindu community wonders if the academic community can ever evoke Hinduism without condescension and the academic community wonders if the Hindu community can evoke Hinduism without sentimentality. The concept of genetic fallacy provides us with the intellectual basis for dispensing with ad hominem attacks. Scholars have long insisted that the truth or falsity of a proposition can only be determined by examining the proposition on its own merits, irrespective of the source. One scientist offers the following telling if homespun illustration of the genetic fallacy: the theory of relativity is false because Einstein was not a good husband or a mere clerk. Character assassination can kill the person (metaphorically speaking) but not the proposition. Thus both communities might wish to steer clear of the genetic fallacy. The controversy recorded in this book has generated much heat. But where there is heat there is also the possibility of light. Perhaps it will shine forth all the more if now the focus is turned towards resolving the pedagogical and epistemological issues raised by it, as it will then move the debate on to a plane where reasonable people might still differ but will have reasons clearer to all for doing so. See Arvind Sharma, “Hindus and Scholars”, Religion in the News (7:1 (2004) pp.16-17, 27. Arvind Sharma, “Insider and Outsider in the Study of Religion”, Eastern Anthropologist 38(1985):331-33. See Arvind Sharma, “Towards a Post-Colonial Comparative Religion? Comparing Hinduism and Islam as Orientalist Constructions”, in Thomas A. Idinopulos, Brian C. Wilson and J.C. Hanges, eds., Comparing Religions: Possibilities and Perils (Leiden,Boston: Brill, 2006) pp. 221-233. Eric J. Sharpe, “Study of Religion: Methodological Issues”, in Mircea Eliade, editor-in-chief, The Encyclopedia of Religion (New York: Macmillan Publishing Company,1987) Vol. 4, p. 25. John H. Hick, Philosophy of Religion (fourth edition) (Englewood Cliffs, New Jersey: Prentice Hall, 1990) p. 89. A.L. Basham, The Wonder That Was India (New Delhi: Rupa, 1999) p. 314. See David S. Moore and George P. McCabe, Introduction to the Practice of Statistics (fourth edition) (New York: W.H. Freeman & Co., 2002) Chapter 6 and passim. Erich Fromm, Psychoanalysis and Religion (New Haven & London: Yale University Press, 1967) p. 12 note 1.